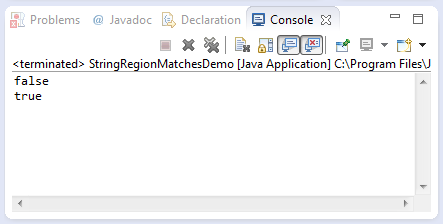 This java tutorial shows how to use the regionMatches() method of String class. This method returns a boolean value true or false. This is generally tests if two string region are equal. To put it simple we are comparing two strings out of the substrings of those string sources. Below are the two overloaded method of regionMatches(). This method returns a boolean datatype. true if the character region matches the specified region of the string parameter. No Exception is expected as specified on java api. This example source code demonstrates the use of regionMatches() method of String class.